What’s in a (park) name? 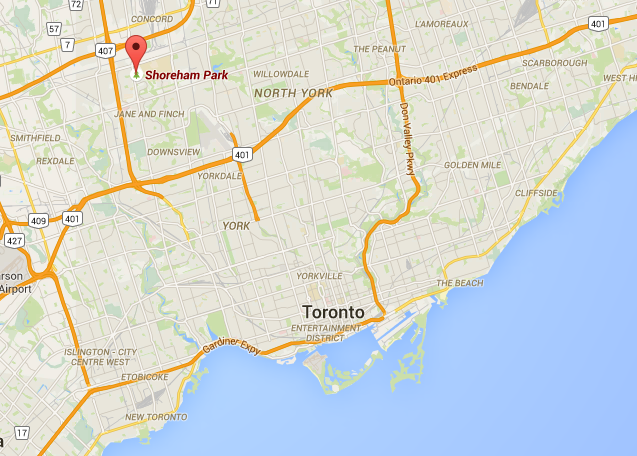 If you Google Shoreham Park you’ll zoom right into the green space near Jane and Shoreham in North York. Visit the park and you’ll find a funky, old park sign with psychedelic sun rays shooting out of it. But do the same search for Shoreham Walkway and you’ll come up with nothing. Yet things are happening in Shoreham Walkway, thanks to a number of community partners nearby working to animate the space. Shoreham Walkway is the “unofficial” name given to the park just south of Shoreham Park on the other side of Shoreham Drive. The name emerged from the work of the nearby Jane and Finch Action for Neighbourhood Change, Green Change Agents, and the St. Alban’s Boys and Girls Club who are working to engage the local community in this green space (they’re putting on a movie in the park as part of the TIFF in Your Park series this summer). They needed a name, so they asked the park supervisor for the area who told them: Shoreham Walkway. The only problem is that the name doesn’t appear anywhere. A park sign with an official name seems like a small thing, but it can be the difference between an undefined blob of grass that you walk through and a park that you meet a friend in or host a community dinner. It allows you to say “meet me in X park,” but it also defines the space as public—a place you can gather and use. So at its most basic, a name turns a space into more of a place. 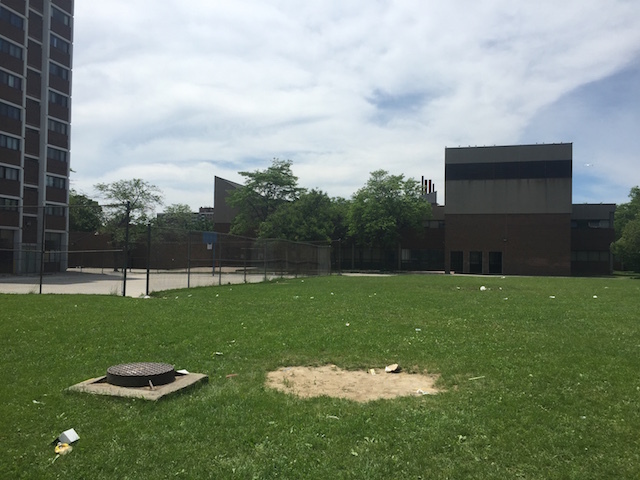 This green space is sandwiched between two schools, a Boys and Girls Club, and a Toronto Community Housing townhouse and high-rise development. It’s a bit of a blank space right now, with a few park benches and some trees. It’s situated in the middle of the block with each building turning its back to it, which gives it a bit of a lost feeling. But with so many uses around it, and a dedicated group of partners working in it, the space has tremendous potential. But walk around its edges and you won’t find a city park sign anywhere. No sign, no name. Passersby could be forgiven for even wondering if it was actually a park at all. 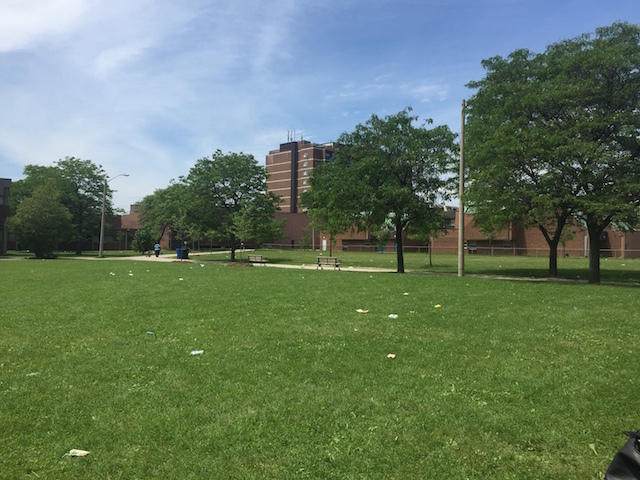 And with the TCH buildings and schools around it, who the green space belongs to is thrown even more into question. Officially, I was told, the name for this park is Shoreham Park—the same as the park to the north. But the two are really distinct spaces and not actually directly adjacent to each other as other parks that have a North/South name are (see: Stanley Park North/South, Chandros Park North/South, etc.). In Toronto we seem to slap a park sign up on even the smallest of parkettes, often resulting in a sign that seems bigger than the actual park itself. But the sign does an important job. It defines it as a public space. Shoreham Walkway deserves the same.